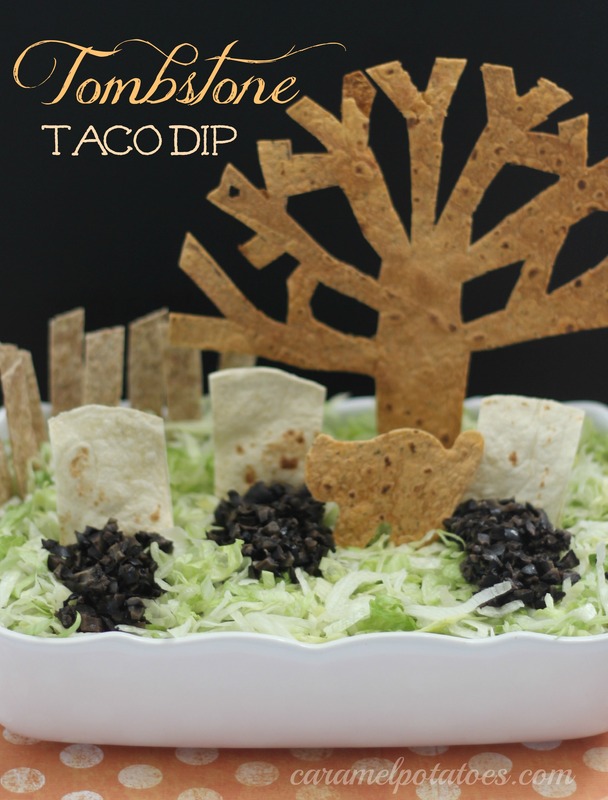 Halloween is right around the corner, and with so many festivities I just couldn’t resist trying this adorable Tombstone Taco Dip from BHG. How fun is this? Just make your favorite layered taco dip and add a few frightful figures made out of flour tortillas – easy! Such a simple way to create a “spooktacular” dish. Place tortilla shapes into mixture. Cover with shredded lettuce. Form mounds of olives in front of tombstones. Serve immediately with tortilla chips. Using cookie cutters, or x-acto knife, cut tombstones and any other figures such as the tree, fence rails, bats, cats, or owls. Bake in a 350 degree oven for 7-10 minutes or until firm and crisp. Cool on a rack. Note: I used different flavored tortillas such as sundried tomato to get more color. You’ll also want to cut them a little long so you have plenty of room to stick them down in the beans. This is so cute. I love the haunting. It’s a classic!